There is more information available on this subject at Civilian on the English Wikipedia. A group of civilians in New Alexandria. A civilian, according to international humanitarian law, is a person who is not a member of his or her country's armed forces. The term is also often used colloquially to refer to people who are not members of a particular profession or occupation, especially by law enforcement agencies, which often use rank structures similar to those of military units. Often, the military's main purpose and occupation is to defend the civilians from invaders. However, many civilians, such as Dr. Catherine Halsey are involved with the military. Several civilians are known to possess civilian identification numbers which functions similar to a UNSC Service Number. It is unknown whether all civilians are supplied such a number, or just those affiliated with certain industries or groups. Civilians only play a side role in the Halo games. 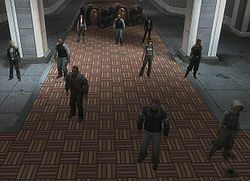 Examples include the Voi factory workers in Halo 3, the civilians on Arcadia in Halo Wars, and the civilians in New Alexandria, Reach in Halo: Reach. Another example is the meta-game Sadie's Story in Halo 3: ODST. However, civilian characters appear more frequently in materials outside the games. Both civilians and civilian vehicles have an increased role and appearance in Halo: Reach. For example, in the level Exodus, the player can save civilians that are being slaughtered by Jiralhanae. Killing a civilian in Halo: Reach results in the immediate death of the player with the message, "You killed a civilian!" Alternatively on co-op, if the player kills two civilians after respawning, Noble Team will turn on the player and kill them instantly with one shot like the Arbiter and Sgt. Johnson from Halo 3. In Halo 4, civilian scientists are encountered during the Raid on Ivanoff Station. Civilians have a more prominent role in Halo 5: Guardians, during the Meridian story arc. The player can interact with them, gather intel in their camp, fight on their side, and discover more information on their lives. Civilians run past a UNSC infantryman while they attempt to escape the Covenant in Second Sunrise Over New Mombasa. Civilians being round up by Covenant in Halo: Uprising. Civilian factory workers in the Halo 3. Police in Halo 3: ODST. Concepts of civilian attire for Halo: Reach. Civilians, UNSC Army infantrymen and Spartan-IIIs of Noble Team in a concept art piece for Halo: Reach. Noble Team with a civilian farmer in Visegrád, Reach. Two types of male and female civilians in Halo: Reach. A civilian on the campaign level Exodus. Civilian female models from Halo: Reach. Close-up of the civilian female models. Concept art of a civilian scientist wearing a facemask in Halo 4. Concept art of a male civilian scientist in Halo 4. Civilians being bombed by T-26B Banshees. Civilians argue on Minab in Halo: Escalation. Civilians watch as a Sangheili Zealot falls to his death in Halo: Nightfall. Civilian miners in Halo 5: Guardians. Concept art of civilian miners for Halo 5: Guardians. A miner firing an MA5D assault rifle at Prometheans.